The design has no locking mechanism, and it is just inertia of the barrel traveling backwards that holds everything together until the bullet leaves the muzzle (as with any blowback design). The recoil energy from the shot has no way to push the breech of the gun rearwards, and so instead it acts on the barrel, pushing it forward against the recoil spring until it locks in place, ready for the next shot. What a neat design, very simple too. I had no idea this even existed. 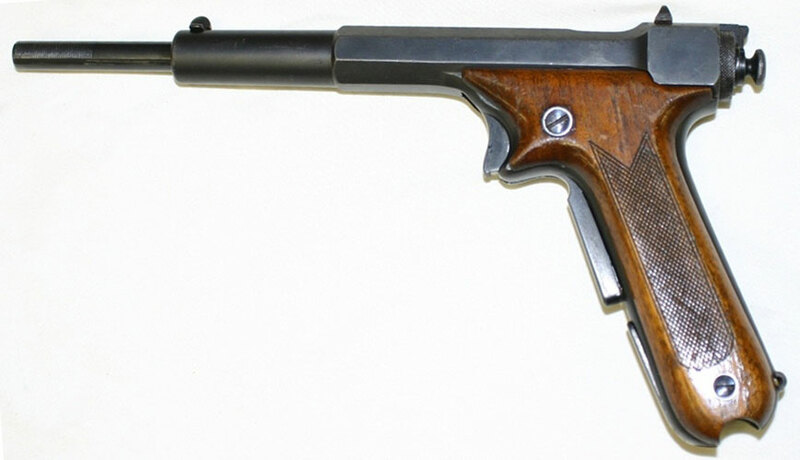 You can read more about it on Forgotten Weapons. This is amazing. It’s also a good illustration of why people like me should never come into an exorbitant amount of money. I’d buy up all these crazy awesome old designs. It looks really brittle, even more so than the Nambu (which I thought was impossible). since it recoils forward it must have almost no muzzle flip. I wonder how reliable the feeding on that gun is. Add another piece to my memory collection of ‘guns I have to replicate before I die’. That is likely true, however, there would obviously be mechanical movement of the cartridge slamming against the firing pin before the round left the barrel. Thus possibly affecting the sight picture. Regardless, terribly interesting. I would love to see it fired. my guess is that the barrel movement is negligible since most of the felt recoil comes from the gunpowder ignition rather than any mechanical motion. I would have to fire one to be sure though. Wow, I thought the Frommer Stop was a really out there design. This takes the cake. Guys, just visit forgottenweapons.com …there is a lot of interesting stuff there like this one! Ha, imagine gun history if that was the “1911” of the last century. Is it just me, or does recocking or clearing a jam from the front of a potentially very hot barrel sound a little awful? If that doesn’t define the gunny attitude, I don’t know what does. That’s pretty sweet. The japanese sucked at making guns. Pretty cool gun though. This guys video could put me to sleep. Probably has a C & R exemption on it. When does FPS Russia test fire one? When it’s featured in the next Call of Duty. Very interesting. Impractical, but interesting. I would have begged for a chance to shoot it. I think what makes it impractical is the lack of trigger protection. It must be very tricky to put it in a holster, and pull it from there ! And the overall design is SO cool, so thin and… aerial.